← New Comic Debut! MESSENGER Begins on LINEWebtoon! FREE! Volume 10 of the Plants Vs. Zombies series of graphic novels appeared on comic shop shelves on Wednesday, June 13! It will be available from other booksellers on June 26! Calling all Cat-Tail Commanders and Spudmarines–the battle for clean water begins! As soon as Dr. Zomboss discovers Lake Gumbo near Neighborville, Gargantuars start posing on Muscle Beach, volleyballs bounce off bungee zombies, and Zomboss uses a giant underwater drill to muddy and pollute the lake! Neighborhood defenders Nate, Patrice, and Crazy Dave spot trouble and grab all the Tangle Kelp and Party Crabs they can to quell another zombie invasion! Having a new Security Gourd group, the unique Kelptomaniac, and returning pig-dog Twister on their side, Paul Tobin and Ron Chan return to the series they helped make a bestselling hit–with bonus stories by Kevin Burkhalter and Christianne Goudreau. 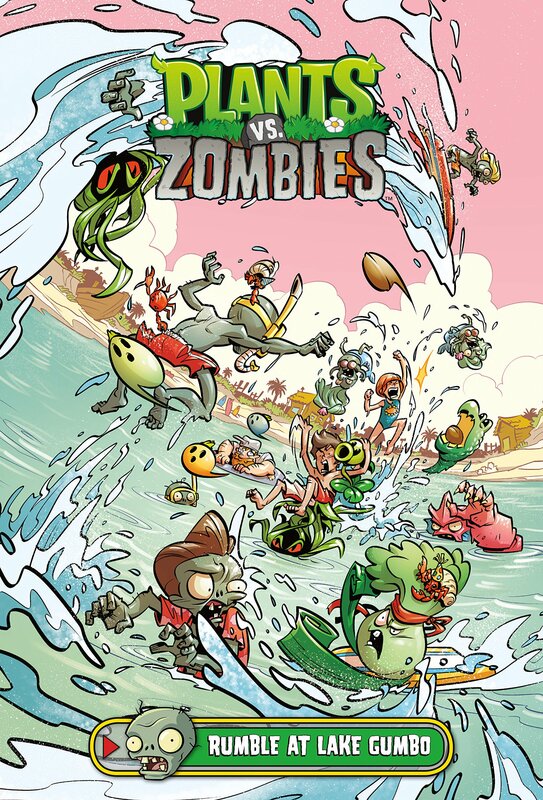 Plants Vs. Zombies: Rumble At Lake Gumbo is written by Paul Tobin, with art by Ron Chan and colors by Matt J. Rainwater!